Kayak Challenge home page: Click here to view the official tournament rules, along with additional tournament information. Open to all Florida Sportsman Forum members fishing in Florida state waters. Registration: cost is $25. Proceeds to go to the TJ and Tommy Recovery Fund, two active Florida Sportsman Forum members who need some help. Notes on scoring: 1) Anglers do not have to catch all included species to win an aggregate category. 2) Anglers cannot win more than one prize Top-3 prizes. The challenge’s winners are determined by fish length. Fish must be whole, non-mutilated (gaff hole is okay for offshore species). Florida Fish and Wildlife Conservation Commission rules and regulations are in effect as it pertains to which fish are legally able to be kept. If a fish is illegal to keep or you don’t plan on keeping it, it must be alive and free from any stringer, especially when photographed. Measurements are made at a granularity of ½ inch. If the fish is larger, but does not make the next ½-inch mark, it will round down. If the fish is larger than the ruler, the maximum length of the ruler will be accepted for the length. If you use a soft ruler such as a sticker ruler or tape ruler, assure that the ruler is on a flat surface and measure the fish on top of the ruler. Do not place the ruler on top of the fish. Tie-breakers of fish measuring the same length go to the person that caught the fish first. That’s why it’s vital not to edit the photo in anyway before posting to the forum. IF IT IS EDITED, WE CAN’T ACCEPT IT. Make sure your camera’s time and date are set properly before taking any photos of catches. The photo’s EXIF data will determine when the fish photo was taken. Length is determined when it’s in a natural lay position. A "natural lay position" is one in which the fish is centrally located on the ruler without any bending or manipulation of the fish to artificially extend its length measurement. Again, a paddle craft must be present somewhere in the photo. Florida Sportsman will create a printable “token” that will be sent to you via email. Anyone who registers before the June 1 start date will receive their token on May 31. Anyone who registers after June 1 will receive their token immediately upon payment. Print out this sheet of paper before fishing. Be sure to include this “token” in any fish photo submitted. 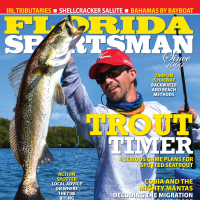 Each angler in the tournament must be a member of the Florida Sportsman Forums. Up to 2 photos will be allowed for one entry to qualify all rules criteria, but they must be submitted in the same day. (One to verify the catch on the water by kayak and one with an accurate measurement.) The tournament token must be present in both photos. Anglers may not intentionally hold back catches until the end of a tournament. In good faith, fish should be checked in within a couple days of the catch (72 hours is the max). No comments or replies will be allowed on the photo posts to keep things simple and organized. Please post the date the fish was caught and length of fish next to your photo. Participants may only use digital cameras for photographing fish. A scoring photo must show the entire fish on the measuring device with the unique Florida Sportsman token present. The measuring device must be in clear view so as to leave no doubt of the fish's position across all the markings, and that the markings of the device are true. Photographs should be taken from above the center of the fish at maximum resolution. The judging committee will review the photos to verify reported results. The fishing vessel must be shown in the background of the photo. The angler must register and pay for the tournament before uploading photos of catches to the forum. Registration fee allows anglers to participate in either the inshore OR offshore portion of the tournament. Kayakers are eligible for only one of the top-three prizes, inshore or offshore. The tournament officially begins at 12:01 AM on June 1 and ends at 11:59 PM on July 31. The day before the tournament begins, a “token” will be emailed to all participants. Anglers should print it and take it with them fishing, making sure it shows in all fish photos. Your last fish catches must be posted before August 1. Entry fee is $25. This tournament is not a money-maker. The tournament entry covers the costs of shipping prizes to winners and costs associated with tournament, such as flyers or measuring devices. Any extra money goes to a forum member in need of medical help. See their recovery fund website here. The best option is to pay online via PayPal when you submit your Registration Form. A second option is to register online and send a check to Diana Matthews at the Florida Sportsman office (Address: 2700 S. Kanner Highway, Stuart, FL, 34994). On the memo line of your check, write "Kayak Challenge" and the name of the participant. All fish must be caught via hook and line. Artificial or natural baits are acceptable. The use of any kayak, canoe or paddleboard is acceptable. Wade fishing, if tethered to a paddle craft, is also acceptable. No motorized vessels may be used, including the use of a motorized vessel to transport (a.k.a. mothership). Using a paddle craft with a trolling motor is not allowed--we want all crafts to be motor-free! The statewide tournament covers all state waters that are open to fishing. For offshore kayak fishermen, anglers must stay inside of federal waters. This levels the playing field for anglers fishing on the west coast. Anglers must use a commercial off-the-shelf ruler. Homemade (read that as: hand-drawn) rulers are not allowed. Prizes will be mailed to the address listed on the tournament entry. A Winner's Certificate will be mailed along with your prize. 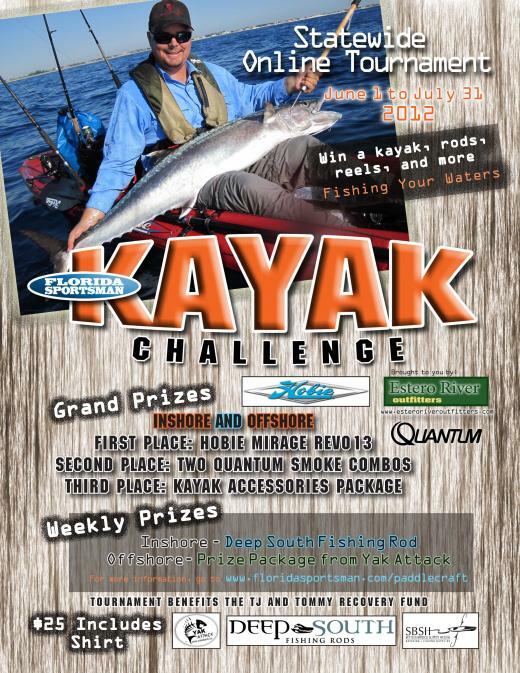 Starting on Monday, June 11, the angler with the largest fish caught during that week and posted to the appropriate “Inshore Kayak Challenge” or “Offshore Kayak Challenge” forum thread wins a prize! For inshore anglers, it's a new fishing rod from Deep South Fishing Rods. Offshore anglers receive a prize package form YakAttack. Sixteen winners total will be decided on June 11, 18 and 25, and July 2, 9, 16, 23 and 30. That means one inshore and one offshore angler wins each week. Kayak anglers can only win one prize, even if they catch the largest fish more than one week. Kayak Registration: Click here to register. I think it's going to be great :grin We put some good thought into it! "1-Grand first place prize: Longest aggregate measurement of 4 different species"
It's that easy! Four biggest fish, yep. But they have to be different species. Yeaaaa!!! i sighned up and i got to help organize the tournament so that was quite a expierence. Signed up and waiting for the 1st to arrive! This should be a great tournament. Tell your friends. The more that are in the better the next one will be. BTT thanks for the event FS! Stoked! gonna be freggin awesome. hope everyone's has enough pride to try and win this tourney without cheating! surprise the winner with a lie-detector just in case!! Signed up and ready to go, just one question. I have a Gator Grip Bluewater ruler and it's only marked in increments of one inch. Is this ok to be still used or would I have to get one that's marked by half inches? That should work, no problem. The committee decided that most commercially-produced rulers were OK (no homemade configurations). We just need to know that the length of an inch on the ruler is actually an inch. "Make sure your camera’s time and date are set properly before taking any photos of catches. The photo’s EXIF data will determine when the fish photo was taken." Does the camera actually have to show the time. I have two different cameras and one doesnt show the time and date. It only shows the date( older sony cybershot it shows the day/time, But not the month/day/time). And my GoPro doesnt. Just curious? Nope, your camera does not have to show the date in the photo. There's extra data associated with the image that can be read when opened in programs such as Adobe Photoshop. That data shows info such as date, camera settings, etc. It's important to have your camera setup with the current date/time, but it does not have to show in the image. I think I asked this in a different spot, but I generally take all my photos on the yak with my iPhone 4s. I'm not sure what EXIF data is or how that translates to a cell phone camera, but would photos taken with my iPhone suffice? Also, not sure if I'll even get to fish much in the month of June, but I'll gladly throw $25 in the pot for a good cause. "I get enough exercise just pushing my luck"
Also, not sure if I'll get to even get to fish much in the month of June, but I'll gladly throw $25 in the pot for a good cause. Iphone 4s will work, no problem. All it takes is one good day of fishing to win! Plus, there's weekly prizes, so it's well worth it! This tournament is shaping up to be a good one! We're getting a steady stream of registrations, too. It all officially starts this Friday! We'd like to a get a head count on the number of shirts to order and design. The sooner you sign up, the better! Getting excited just reading this thread. Good luck to all!! Owner/Operator of www.ReelsAndTackle.com :banana A family owned small business. First Post! Been lurking around here for a while... Finally created an account to get in on this tournament. Can't wait! Any word on when those of us that are signed up will be receiving our tokens? I never received a confirmation email from floridasportsman.com after signing up, emailing my waiver or paying. Just want to be sure I am good to go for this weekend. Sending them out today! Within the next two hours! Thanks Sam!!! Really excited for this tournament!! Just finally got all my sign up done didn't realize I had a issue with my pay pal account.. Can't wait, looking to get on the water this sunday!